“’I don’t even really understand the second act,’ a filmmaker said to me just last week. He obviously hadn’t read Syd Field’s Screenplay, which is nothing if not about act structure: the first, second and third acts, but also the inciting incident, pinch one, plot point one, midpoint, pinch two, plot point two and resolution.” (From Scott Macaulay’s article on Filmmaker magazine). Syd Field was the pioneer. The first one. The one that found the key and the door. He set himself on a mission to find a method to teach screenwriting. He did it, not by using only abstract content, but by finding tools. A breakthrough for many. Once as a script reader, he was forced to read 2000 scripts and he selected only 40. What amazes me is not the 40 but the 2000. By reading so many he inferred what all good scripts had in common and what all the bad scripts had in common too. This is it. As God created the Sun and we all saw. Simple and powerful, what you just read changed the way the craft of scripting was viewed, made a lot of scholars debate and created a new form of business that singled out a figure known as the Guru of Screenwriting. And Field is Guru #1. OK, in a way he was not the first. First came Aristotle, Lajos Egri… They started the ladder, but Field filled it in with a new basic step. “One script page equals one minute of screen time”, at least as a rule of thumb. In my experience of directing TV series, that is generally true. But once I was given two 70 page scripts, one ended with a 60 minute episode and the other with an 85 minute episode. Those were extreme cases. Usually, it’s about right. “What do all stories have in common? A beginning, middle, and end (…) ; it [a screenplay] is a story told in pictures, in dialogue and description, and placed within the context of dramatic structure. Aristotle talked about the three unities of dramatic action: time, place, and action. The normal Hollywood film is approximately two hours long, or 120 minutes”. “Act I, the beginning, is a unit of dramatic action that is approximately twenty or thirty pages long and is held together with the dramatic context known as the Set-Up.” I think that this is true and that there a physical reason for this: generally the human mind can’t take more than 30 minutes without knowing what’s going on. “1. What Is a Screenplay?” If you have time to read only one chapter, this is it. It contains the core of Field’s philosophy in a very clear manner. His basic concepts are all there. “3. The Creation of Character, 4. Building a Character and 5. Story and Character. ” Some very big essential truths are being said and developed here: “Action is Character”, “A character is not what he says, it is what he does”, “Know your character”. But, the way Field emphasises the creation of biographies for characters does not work for me. It’s my belief that the character exists as it is connected to the story and only the aspects of his/her private life and history linked to the story are relevant. The rest seems superfluous to me. “6. Endings and Beginnings”. “Direction (…); your story moves forward from point A to point Z, from set-up to resolution”. “That means your story moves forward from beginning to end. You’ve got approximately ten pages (about ten minutes) to establish three things to your reader or audience: (1) who is your main character? (2) what is the dramatic premise—that is, what’s your story about? and (3) what is the dramatic situation—the circumstances surrounding your story?” All true and essential. But then Field displays one of his favourite mantras: “KNOW YOUR ENDING”. And this is where I find myself at odds with him again (with all due respect, of course. He is a Master, I am not). I do believe that at some stage you have to know your ending, but I do not think that you have to from the very beginning. Writing is a voyage, and sometimes when you travel, you get to unexpected places. And those places will make your travels worth remembering. Of course you have to have some ending when you work. But probably the final ending will appear in front of you as, by sweating and working your brains out, you get to know the characters, the plot, the atmosphere, the genre and the style. But still, if KNOWING YOUR ENDING from the very beginning works for you, please use it. I wouldn’t. “7. Setting Up the Story”. 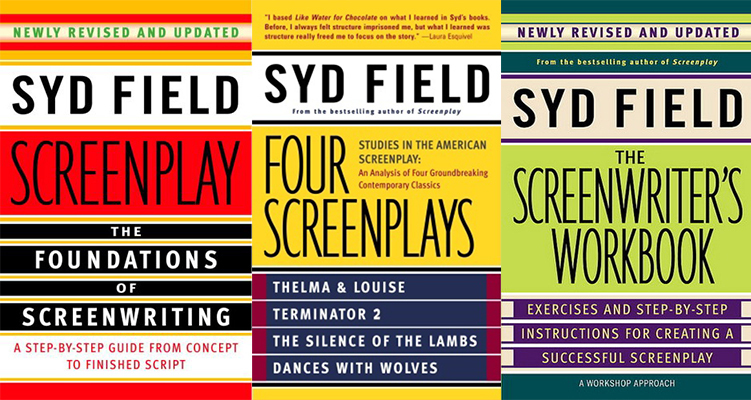 When Field deals with structure, he is at his best: “I tell my students you have to approach the first ten pages of your screenplay as a unit, or block, of dramatic action. It must be designed and executed with efficiency and dramatic value because it sets up everything that follows.” It is a proven fact that, as members of an audience, we decide whether we like a film or not during the first ten minutes. So getting those right is a matter of creative life-or-death. “9. Plot Points. ““Plot Point I, the key incident of the script. This is the incident that sets in motion the entire screenplay”. “Plot Point I is the true beginning of the story”. “The Plot Points at the end of Acts I and II are there to hook in the action and spin it around in another direction. They are the hub of the story progression, amp the story up to the next”. “Act I, Act II, Act III. Beginning, middle, end. 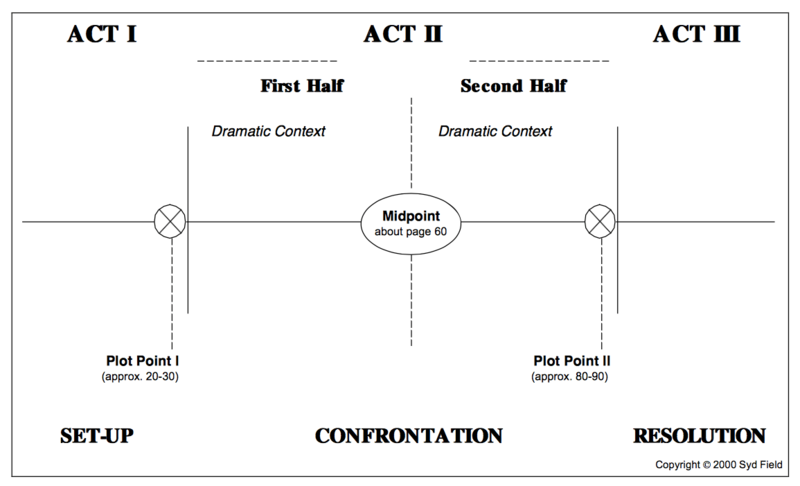 The beginning starts with the opening scene or sequence and goes until the Plot Point at the end of Act I. The middle starts at the end of Plot Point I and goes until Plot Point II. The end begins at the end of Plot Point II and continues to the end of the screenplay. Each act is a unit, or block, of dramatic action, held together with the dramatic context: Set-Up, Confrontation, Resolution. Act I is a unit of dramatic (…) action that goes from the beginning of the screenplay to the Plot Point at the end of Act I. There is a beginning and an end point. Therefore, it is a whole, complete unto itself, even though Act I is a part of the whole (the screenplay). As a complete unit of action, there is a beginning of the beginning, a middle of the beginning, and an end of the beginning. It is a self-contained unit, approximately twenty to twenty-five pages long, depending on the screenplay. The end is Plot Point I: the incident, episode, or event that hooks into the action and spins it around in another direction, in this case, Act II. The dramatic context, which holds the content in place, is the Set-Up. In this unit of dramatic action you set up your story—introduce the main character, establish the dramatic premise (what the story is about), and sketch in the dramatic situation, either visually or dramatically. Want more? Check Syd Field.com. This entry was posted in BOOKS on screenwriting, SCREENWRITING and tagged Screenplay: the foundations of screenwriting, Syd Field. Bookmark the permalink.